On 18 and 19 October, GAP crew presented recent project developments at the International Society of Military Sciences „Military Sciences and Future Security Challenges” international conference was organized by the National Security Department, with the participation of the entire university and members of ISMS. International Society of Military Sciences is an association that brings together military universities such as: Austrian National Defence Academy, Baltic Defence College, Royal Military College of Canada, Royal Danish Defence College, Finnish National Defence University, Netherlands Defence Academy, Norwegian Defence University College, Royal Military Academy of Belgium and War Studies University to exchange their observations and research results, and pursue that in military sciences it is not just about technology, techniques and procedures, because all conflicts concern people first and foremost and the military is not separated from the society. During this jubilee conference, since the Association celebrated its tenth anniversary, the opening of the conference had a very festive character, due to the participation of all Rectors – Commandants of the universities who are members of the association. During this conference, where apart from celebrating the decade of existence of the association, there was ample time and place for debate and exchange of ideas. The most important thing was to find the answer to two very important questions: “What should be the balance of our efforts in the military profession, between transforming military science to serve prevention and management, and maximizing capacity for winning wars?” and “What do defence universities have to do to fulfill their responsibilities to society and the international community as custodians of the military sciences?” The participants could find answers to these two questions during speeches in 9 working groups. The participants were able to hear about 70 lectures during these two productive days delivered by international speakers from around the world. 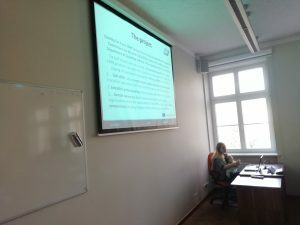 During lectures in one of the panels, Security Education, Dr. Kamila Trochowska presented a speech on “Soft Skills for Security and Defense: Cross-Cultural Competence and Beyond”, which was devoted to the Gaming for Peace project’s 3C aspects. Moreover, the participants had the chance to further discuss GAP developments at the series of posters by Prof. Anne Holohan, Dr. Kamila Trochowska and Kamil Kuć. The “GAP: The Proteus effect in action” poster explained the 101 of the project, “Soft Skills and the Polish Police – interviews results” which summarized the results of research carried out by Dr Walentyna Trzcińska and MA Kamil Kuć about preparation for foreign missions in the Polish Police, and “GAP and Cross-Cultural Competence” expanded on operationalization of culture for CPPB purposes and the game itself. The presentations received a truly positive feedback from our potential and future end-users. As one of te experienced military participants put it: “The world is changing, technology goes along. We must use the maximum of this technology be able to end conflicts faster. I believe that if this game fulfils its mission, we will witness progress in people, too”. The latest Gaming for Peace newsletter has been published! We are happy to present to you the Gaming for Peace -project’s Newsletter. This issue concentrates especially on the mid-term review conducted by the European Commission. The European Union Comprehensive Crisis Management Course organized at the Finnish Defence Forces International Centre opened in Helsinki on 10 September. The course is held in Santahamina Helsinki – organised within the frameworks of the Finnish Centre of Expertise in Comprehensive Crisis Management- and brings together civilian, military and police experts in the field of crisis management and international affairs. Laurea University of Applied Sciences hosted GAP-project’s mid-term conference in Espoo, Finland on 19th September. The theme, Learning Soft Skills in Peacekeeping “Training Through Gaming”, attracted around 100 participants interested in how gaming can improve the training of civilian, military and police to be deployed to crisis management missions. During the conference experts from different partner organizations held sessions on various topics concerning soft skills in crisis management training. 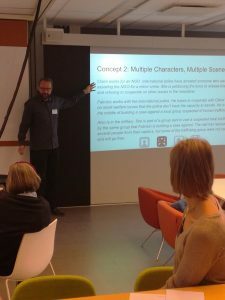 On workshops facilitated by the Haunted Planet Studios, the participants gave input to different concepts of GAP’s digital roleplaying game. The Haunted Planet Studios continues to develop the game format based on the views of the workshop participants. Gaming for Peace Consortium is currently represented by Laurea University in IAPTC (International Association of Peacekeeping Training Centres) Conference in Cairo, Eqypt. GAP representatives contribute by leading the discussions about improved online training targeted for the personnel to be deployed in complex peacebuilding environments. 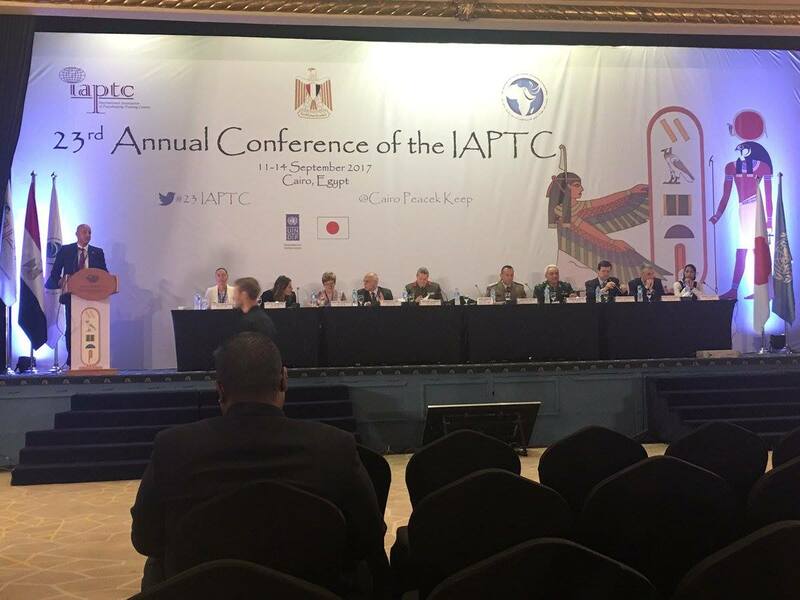 More information about the conference: 23rd Annual Conference Of IAPTC, Cairo, Egypt – 2017 (www.egypt.iaptc2017.org) The 23rd Annual Conference of the IAPTC will be held in Cairo, Egypt, from 11-14 September 2017. The Conference is being organized by the Cairo International Centre for Conflict Resolution, Peacekeeping and Peacebuilding (CCCPA) –Egyptian Ministry of Foreign Affairs–in partnership with the Egyptian Ministry of Defense and the Egyptian Ministry of Interior. New cooperation between legislators has helped ease tensions in Moldova. The improvement in center-autonomy relations highlights the importance of settling disputes before they grow into open conflicts. For the first time in the United Nation’s Military Experts in Mission Course’s (UNMEM) history there were more female officers than male. In addition to this UNMEM 2-2017 was also training Military Advisors for high level positions in peacekeeping operations. The course was held in August by Finnish Defence Forces in Helsinki and Niinisalo. The participants represented 21 different nationalities from Europe, Asia, South-America and Africa. A free, four week online course ‘Achieving Sustainable Development’, developed by a collaboration of four Trinity College Dublin Schools launches on 11 September 2017. GAP data is used also in the course module on Peace building. Cross-cultural aspects of the game and its design as such are an essential aspect of our work. 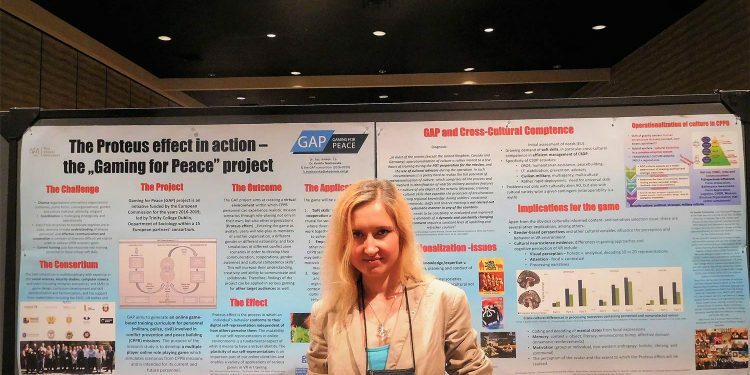 Therefore, Dr. Kamila Trochowska from the War Studies University in Warsaw, discussed the premises of GAP and its cross-cultural aspects at the 8th Applied Human Factors and Ergonomics Conference that took place in Los Angeles, July 17-21, 2017. The conference objective is to provide an international forum for the dissemination and exchange of groundbreaking scientific information on theoretical, generic, and applied areas of human factors and ergonomics – and is the most significant interdisciplinary society gathering specialists from such diverse fields as cognitive computing, training and education, affective design, serious gaming, cyber security and decision-making, to mention just a few. The poster: “Proteus Effect in Action: The Gaming for Peace Project” by Dr Trochowska and Principal Investigator Anne Holohan featured the basic premises, methodology and goals of the GAP project and the results of the recent research report performed by the author on the state of cross-cultural competence training for CPPB, and the prospects of applying them in serious gaming for the military and civilians. It was presented within the AHFE Cross-Cultural Decision-Making track that examines human cognition and its interplay with various cultural constructs, such as geographical, historical, sociological, and organizational cultures. The project was discussed with researchers, scholars, and industry practitioners from diverse countries – from Japan to Australia – and of diverse backgrounds, including sociology, linguistics, business, military science, psychology, human factors, neuroscience, and education. The most interesting conclusion of the multidisiciplinary debates was the potential of applying a variety of game effectiveness assesment methods, including EEG and electromyography. That is one of the major tasks within the evaluatory WP 5 that we have just initiated. Stay tuned for the development! GAP-project’s (Gaming for Peace) first newsletter for July 2017 has been published. In future, the monthly newsletter will introduce the development of the project and articles regarding conflict prevention and peace building.